This is my pride and joy. A place where I can express my love for all sentient beings and devotion to the vegan movement. Sticking to your vegan ethics with vegan food is easy when you’re on your own.. However, outside influences can interfere–ask anyone who is part of the vegan society! Even some foods that seem like they’re 100% plant derived, like sugar, can actually have some undesirable additives and animal by-products that you may not be aware of. These and other issues are essential to navigating the world as a committed vegan and it’s out mission to fill you in on everything you need to know. Whether you’re just starting out with a vegan lifestyle or you’ve never known any other way of eating, knowledge is the key to successfully living out your ethics in every way. Gluten-free vegan diets are healthy, satisfying, affordable, and easy-to-follow. If you want to protect your health, treat animals humanely, and live in an eco-friendly way veganism is the way to go. Knowledge is power when it comes to your vegan way of life. With VeganProducts.org, you’ll get the background info and guidance you need to stay on track and remain focused on your lifestyle goals. From lists of vegan-safe beers to vegan box deliveries, I’ll give you the full scoop on the products and ingredients you can safely enjoy. I want to help you live the life you want while staying true to the values and the beliefs that guide you through each day. Are you trying to gain muscle mass and sustain an intensive weight lifting or cardio-based exercise regimen? A vegan diet can be your best asset on the road to health and fitness success. The idea that vegans can’t get enough protein and nutrients to sustain high-level athletic training is ridiculous, of course, but it’s a myth that persists. Don’t be fooled by false information on bodybuilding websites and forums. Plenty of high-level athletes, including bodybuilding competitors and Olympic champions, eat a 100% plant-based diet without any animal-derived protein. The days of the meat-based fitness diet are over, but that doesn’t mean you have to turn to dairy to get the fuel you need to gain mass and improve your overall physical fitness. Whey protein is commonly suggested for vegetarians, but there are even more plant-based options available for vegans who want to use protein powders as part of their fitness diet strategy. In fact, some of the best protein powders use completely vegan, plant-based protein sources such as yellow peas, hemp seeds, brown rice, soy, and oats. That means you’ll have plenty of protein powder varieties to consider as you get focused on your diet and fitness goals through the lens of vegan ethics. Aside from protein powders, there are plenty of ways to adhere to a completely vegan lifestyle and still consume the right kind of food to fuel athletic pursuits. 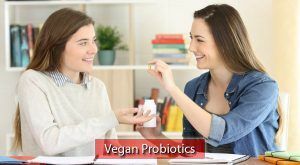 From complete amino acids to filling alternatives to soy protein, you can keep your body energized and strong without making any ethical sacrifices or compromising with vegetarian-safe—but not vegan—recipes and products. Don’t believe what you hear about vegan diets being insufficient to sustain a high level of physical activity. All it takes is a little knowledge and the right information. What is the real difference in performance between a vegan bodybuilder and a meat-eating bodybuilder? It’s increasingly clear that vegans aren’t the weaklings we’re often made out to be. Cut through the misinformation and find out just how healthy vegan bodybuilders can be. Meat-eating athletes often buy into incorrect information about the importance of animal protein, sometimes to the point of almost completely eliminating plant-based foods from their diet through a misguided fear of carbohydrates. But too much protein, especially the fatty, cholesterol-loaded protein that comes from meat, can be damaging to the body in many different ways. Find out what a meat-eating bodybuilder’s diet is actually doing to their bodies and learn what sets the vegan bodybuilder apart. Gain inspiration and learn firsthand how a successful athlete gains major muscle and sustains top-of-the-line workouts on a completely plant-based diet. These musclebound vegans are proof that the meathead attitude is a thing of the past. You can achieve the look and musculature you want without buying into the myths about meat-focused diets. We’ll profile people like Kenneth G. Williams and Amanda Riester, champion athletes and bodybuilding competitors who show that what you eat can also reflect your values, even when you’re facing the toughest competition. Loving animals and caring about the environment isn’t contradictory to the pursuit of physical excellence, and there’s nothing weak about veganism. These famous vegans prove that to be true with their numerous accomplishments and awards. They’re paving the way for a new approach to nutrition in the bodybuilding world, and we want to lift them up as a way of promoting veganism for anyone who’s interested in getting into better shape and achieving their best. Let’s take a look at some of the best books available for anyone who’s interested in doing in-depth research into the world of vegan bodybuilding. I’ll review some of the most popular and highly regarded published guides to bodybuilding on a vegan diet and share our honest opinions with you. With this information on your side, you’ll be able to make a fully informed decision as you decide which vegan bodybuilding books to add to your growing library of literature about veganism. The more education you have, the more successful your efforts will be, so don’t hesitate to purchase more than one of these books if our reviews paint multiple pictures of information that seems like it would be useful for you. Protein is an essential component of a successful bodybuilder’s diet, but can you really get the protein you need from a vegan diet? This part of our site dives deeper into the concept of a vegan bodybuilding diet by focusing on this important dietary building block. We’ll show you how to get the protein you need to fuel a bodybuilding workout routine without any animal-derived products or meat. Vegetable proteins are healthful, filling and absolutely sufficient to power your bodybuilding career. If you want to ditch the dense, fatty, meat and switch to a healthier, more ethical diet, you don’t have to give up protein and you certainly don’t have to give up on bodybuilding. Creatine is a natural chemical compound that is directly related to the brain and muscles’ ability to properly employ available energy. This makes it an essential component in a bodybuilder’s diet, and while meat products are a common natural source of creatine, you don’t need to sacrifice your vegan ethics to get it. I’ll go over good vegan sources of creatine and highlight products that supplement this essential, all-natural element for a bodybuilder’s diet. As the body’s most important amino acid, glutamine has a lot to do with protein, making it a popular supplement for bodybuilders and athletes of all kinds. This part of our site covers 100% plant-based glutamine sources for vegan bodybuilders who want to add this supplement to their diet without violating their ethics. Branched-chain amino acids (BCAA) are essential for adding lean mass and maintaining the right balance of food intake as a bodybuilder. If you’re looking for pure vegan BCAA supplements, we’ll help you find them with a comprehensive list of products that meet your needs from both a dietary and athletic standpoint. Supplements are old news in bodybuilding, but did you know that you can get all the supplements you need without relying on any animal-derived ingredients? This section of our site details all of the best vegan bodybuilding supplements for a classic approach to bulking up and staying fueled for your workouts. Learn about the brand names and ingredients to look out for so you don’t have to make any compromises on your lifestyle and ethical priorities. I’ll provide all the details and do the research for you so you can focus on your workouts. Supplement stacking is part of a comprehensive approach to bodybuilding nutrition. When you’re working out and burning tons of calories in the gym, you need to ensure your body is getting the fuel it needs before, during and after your workout so you can maintain optimal calorie and nutrient balance. This detailed look at vegan bodybuilding supplement stacks provides a clear path to using plant-based products for your supplement stack without any animal-derived ingredients needed. Myths about ultra-limited diets are also not worth buying into. There are so many different product options you can choose from when your diet is 100% plant-based. You can even find fully vegan products on the shelves of every major grocery store, though they aren’t necessarily labeled as such. Vegan diets are far from boring, but caution is in order whenever you’re considering a new product. Animal-derived materials show up in weird ways in many industrial food manufacturing processes, but even some time-honored traditions that date back before the pre-industrial age see non-vegan elements being used. Even Campari, the bright red Italian liqueur, uses an ancient dye derived from insect shells to get its signature hue. When it comes to commercially prepared foods, it’s best not to make assumptions. You never know where an animal-derived ingredient or production process element may sneak in. Even if you read nutrition labels and ingredient lists religiously, there are still some things you could miss. This is especially true if it’s part of the manufacturing process, which doesn’t have to be reported on the label. As a committed vegan, your investigations may have to go deeper than what’s stated on the package. My database of vegan ingredients makes it easy to tell what’s what when you read a label. Avoiding assumptions is vital to staying on track, especially when it comes to some of the alphabet soup ingredients you’ll find in modern packaged foods. In addition to telling you which ingredients are unsafe for vegans, I’ll tell you about some safe alternatives so you can go on with your life without having to sacrifice your favorite flavors. I want to make vegan living as easy and accessible as possible, and you can benefit by reading our reports and learning more about what’s actually in the food you buy. Ingredients and foods with hidden animal-based derivatives or additives aren’t the only products vegans have to be careful to avoid. Packaged foods come with product labels, and while those clearly don’t always include animal products used in manufacturing (as I discussed above), the clothing, housewares, tools, makeup, personal care items and tools we buy don’t have these ingredient lists. Grocery shopping requires careful consideration for vegans, but we have to be vigilant when shopping for non-food items as well. From abhorrent animal testing practices to surprising origins for ingredients in everything you shop for, I’ll help you learn what to look out for as you navigate the world with a strict ethical code. This is a great resource for anyone who’s new to veganism who may not yet realize what’s off limits, but even long-term vegans are likely to be surprised by some of the items on this list. We want you to be empowered and informed, so we’re going to dig deep and find all the info you need. Subscription boxes have become quite trendy and it’s easy to understand why. You can get a wide range of treats, supplies, toys, and other products delivered right to your doorstep—you don’t even have to spend time shopping. All you have to do is sign up and pay a fee to join a subscription box delivery service. It’s like getting a special gift picked out just for you every time your delivery arrives! Vegan box deliveries can make it easier to get your hands on plant-based snacks, especially if you live in a remote location or a part of the world where veganism isn’t yet the norm. However, just because it’s vegan doesn’t mean it’s good. We’ll test out some of the most popular and promising vegan box delivery services and let you know what we think. It could end up saving you some money and frustration on a bad box or give you suggestions for fantastic new boxes that will bring delicious treats to your home or office at regular intervals. Delivery boxes make good snack pantries for yourself, but they can also be great gifts for all your vegan friends and family members. Some of these boxes include snacks that are so good anyone will love them, even if their diet includes some animal-derived ingredients. Get the reviews you need to make an informed decision on which boxes are right for you and the people you love so you can avoid the gamble of shelling out money on an untested product. 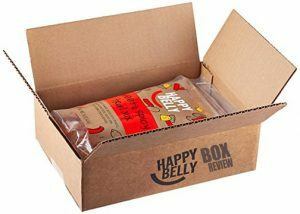 The Happy Belly Box delivers 4-6 vegan, gluten-free, non-GMO, minimally processed foods for a low monthly price. Does it deliver on its lofty promises? We’ll review the monthly delivery and the products that arrive so you can assess whether the Happy Belly Box is a good choice for your lifestyle. What is it that sets the Happy Belly Box apart? Let’s find out. 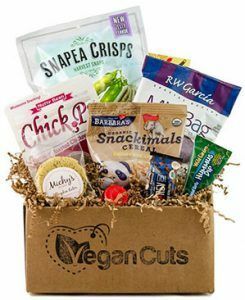 You can indulge your vegan snack food cravings and indulge in some healthy goodies with the Vegan Cuts box. This award-winning box focuses on 100% vegan snack foods and can include everything from high-end vegan chocolates to nut-based coffee creamers and snack chips made from protein-packed beans. It puts a wholesome spin on the foods we love to eat but often feels guilty consuming. The focus on vegan nutrition on display in this box means that guilt can go out the window—but is it worth your money? Check out our review to see what we think of the value this creative subscription box offers. 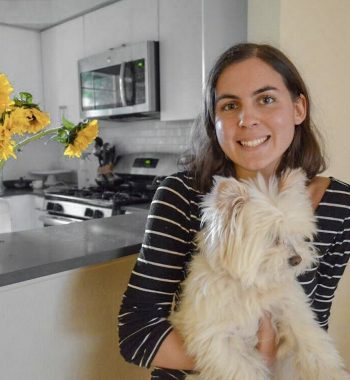 Conscious Box is curated monthly by nutritionist and author Heather Bauer, and it offers a range of different snacks that can accommodate vegan, paleo, and kosher diets. There are many products on offer with this box and you may find some new-to-market snacks and foods that can keep you feeling full and fueled as you go about your day. Even candy items like chocolate nut butter cups are sourced from companies that focus on providing non-GMO alternatives to highly processed, conventionally manufactured foods. The Conscious Box offers an easy way of discovering delicious new foods without requiring you to invest a lot of time at the grocery store or online. 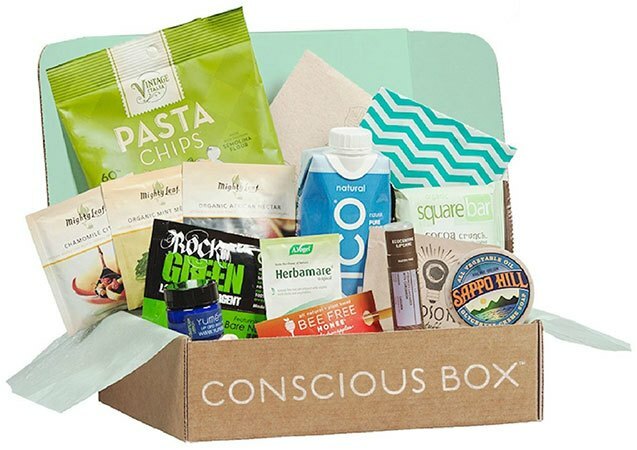 We’ll dive in deeper to give you details on what comes with the Conscious Box subscription and what we think of its claim to cater to a strict vegan diet. Life as a vegan can be tough in rural areas, but if there’s one thing most remote places in the USA have in common, it’s Walmart. Whether you’re vacationing, going to college or living life as a resident in one of these rural areas, this list of vegan products found at Walmart will make life easier. 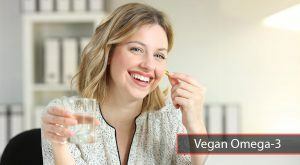 You’ll be able to go about your business and get the grocery, home and personal care products you need to stay comfortable and committed to veganism, even while living in an area that doesn’t exactly cater to your choices. You may be surprised by how long the list of vegan products at Walmart actually is! Trader Joe’s seems to claim that a lot of its foods are all-natural and healthy, but are they vegan-friendly? This grocery store is a major destination for convenience food and unusual ingredients, and while their produce section may have a lot of options, the other aisles in the store can be less certain. Our vegan shopping list for Trader Joe’s will take the guesswork out of shopping at this tropical-themed grocery chain. 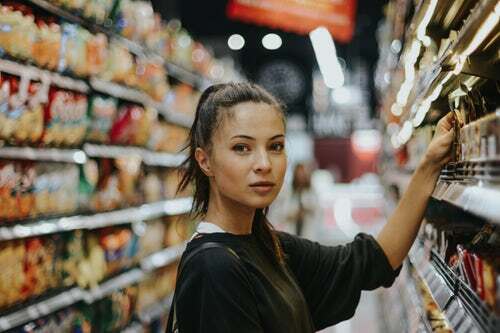 Whether you’ve shopped at TJ’s dozens of times in the past or you’re brand new to the store, this grocery list will guide you in the right direction and help you discover new favorite meals, snacks, drinks, household products, and ingredients. Stocking up on bulk products can be extremely convenient, but the last thing you want is to brave the crowds at Costco and bring home a massive supply of something you actually can’t use. Use our Costco vegan shopping list to avoid this unfortunate circumstance and ensure that everything you buy from the warehouse giant is in line with your ethics and lifestyle priorities. Tesco is a massive grocery store chain that dominates the supermarket landscape in countries across Europe, Asia, and the United Kingdom. Our Tesco vegan shopping list makes it easy to stay committed to veganism wherever you are in the world. Whether you’re on vacation in an unfamiliar place or you’re a local wondering where to stock up on the products you need, this part of our site makes it easy to find the right products to sustain your lifestyle in the dozen countries where Tesco does business. Giant grocery stores can be overwhelming for vegans, but this animal friendly Safeway shopping list will make it much easier to target the foods, personal care items and home maintenance products you can actually use. If you find shopping for groceries overwhelming and hate having to spend time carefully researching everything you buy, this list will give you an easy shortcut you can count on. Most experienced vegans are well aware of how few people know the difference between veganism and vegetarianism. The two lifestyles may seem similar to omnivores, but when you’re focused on eating only plant-derived foods, the gulf between life as a vegan and life as a vegetarian is massive. Eggs and dairy are used to make a huge range of products and even subtle things like milk powder or small garnishes of cheese can make or break a dish’s suitability for a vegan diet. If you’re considering making the switch from a flexible vegetarian diet to a more focused, intentional vegan diet, you’ll need the right information to make the transition as smooth and successful as possible. You may even want to look into some vegan-friendly flavor substitutes so you can enjoy your food just as much as you used to without making any compromises on your ethics. Vegan cooking is just as satisfying as vegetarian cooking, but with a few clever twists that replace savory animal-derived umami flavors with comparable-tasting ingredients that come from plants. Ingredients like nutritional yeast, tamari, liquid smoke, and cashews are about to become your best friends! A thorough explanation of the differences between vegans and vegetarians can also be helpful for friends and family members who want to support new or long-time vegan loved ones on their journey to health, wellness, and ethical living. If anyone you love is confused by your choices, you can point them to this section of our site for a complete exploration of the concepts that underpin the choice to live life without using any animal products. Bad diets cause long-term damage to health and wellness, and it’s clear that meat eaters risk putting themselves in an early grave due to their dietary habits. But is going vegan the solution? Are vegetarians doing damage to their long-term health by including dairy or eggs in their diet? We’ll explore this idea and explain to you why we think veganism is best. There are some interesting statistics and logical conclusions to consider when it comes to life expectancy for vegans vs. vegetarians. If you want to stay as healthy as possible for the long haul, read this section of our site to find out exactly how a vegan diet can help power you through to a long life of wellness and happiness. This information could be all some vegetarians need to finally make the switch to a fully vegan lifestyle and change their lives for the better, forever. Hopefully, it will also show some meat eaters the light and convince them to change their ways. What do people mean when they say they’re vegan or vegetarian? The difference between the two can be confusing to those who don’t understand what the lifestyle is all about. Vegetarianism and veganism are not the same things, but the labels are complex and detailed in a way that often creates befuddlement for those who want to avoid the consumption and/or use of animal-derived ingredients and products. If a person wears leather, for example, can he really claim to be a vegan, or is he just a vegetarian in disguise? We’ll explore these kinds of issues in more detail so you can gain a better understanding of what the vegan lifestyle entails. Some people claim to be vegetarians but still eat fish. Fish are animals, and no one who eats them can actually be considered a vegetarian. These people are pescetarians; the root word “pesce” derives from the Latin word for fish. Pescetarians often consume no animal products other than seafood, or they may include dairy and eggs in addition to eating fish. However, because fish is in fact meat, these people cannot correctly claim to be vegan or vegetarian. A person who eats no meat other than fish is considered a pescetarian. This distinction is one many people don’t seem to understand, and we’ll discuss it in detail in this section of our site. There are many great vegan products. Its a reason I like Ethiopian food because they have a lot of vegan dishes.